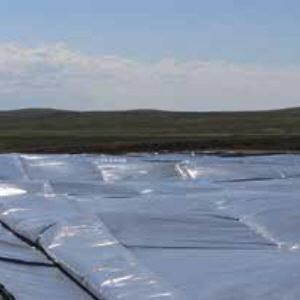 GeoSkrim® J25DT1 & J30DT1 are 25 and 30 mil linear low density polyethylene geomembranes reinforced with a heavy encapsulated 1300 Denier polyester reinforcement. In addition to excellent dimensional stability the tri-directional reinforcement provides exceptional tear and tensile strength. GeoSkrim J-Series membranes are formulated with thermal and UV stabilizers to assure a long service life. Custom colors are available based on minimum volume requirements. Click here for Product Data Sheet.